Once in a while I get a request to identify a piece of vintage furniture. More often than not, I’m not very helpful because I still only know the stuff everyone else knows. Here is another case in point. At least three readers over the last few weeks have asked me to identify their specimen of this little guy from the late ’50s. It’s a small, low chair, made of a single piece of bent plywood with dowel legs. eBay seller mix-mod sold this one for $500 in Nov. 2005 and others have seen that price in local stores. Called Carter Furniture in Salisbury, NC. Woman who answered was kind enough to walk the floor with this photo and found a 48yr employee who said she remembers this design being discontinued around the time she started in 1958. Thereafter it was a 1 cushion model. Also discovered it was made in their original plant behind some VA Hospital in town. Carter Furniture has no records on this chair. Bummer. So we know at least one manufacturer — but who designed this little beauty? The others I’ve seen have a single cushion, as mentioned by the Carter lady. Sent to my email box today from Angela Hamilton. If anyone has more information about this chair, Jeff, Travis, Angela, and myself will be most grateful for it. Until then, we’ll just admire its simple elegance. Update: Photographs from Dana of Danishmod.com. See her comment below. Update: Carly Albee, whose grandfather owned Carter Furniture when this chair was made has identified it as the “Scoop Chair”. Read her story. Update (Dec. 22, 2008): More Carter Bros. Scoop Chairs for sale at DanishMod. I am fairly certain this is not an Eames. Their wood shaping is much more refined. You can familiarize yourself with their work at Eames Collector which displays most of their designs. This is definitely not an Eames. More than likely a more commercial piece. Have a yellow one myself..since I was a kid. (age 44) I went to Cranbrook Academy of Art for my MFA and I feel bad I can’t find out who made this! ( Charles and Ray Eames are frowning down on me..I can feel it) Please drop me a line whoever finds out the manufacturer. Thanks! Wait, so the 48 year old woman started working there in 1958? Two years before she was born? Did anyone happen to see the set that were on eBay last week? they sold for just over $3000.00 for the pair. Brad Pit also had one in his office in the movie Mr and Mrs Smith. And, Rory Gilmore (The Gilmore Girls tv series) had one in her dorm room on her first day at Yale, that is, until her grandmother re-decorated it ! ( And I think that 48 yr employee meant someone who worked there for 48 years). I have a few more pics of redone ones in leather – should I send them in here? Oh, and there’s a pair that were “doctored” on shape, and they’re on 1stdibs under “eames” (which they’re not ) for $7800, which in my opinion is nuts. My Grandfather owned Carter Furniture when this chair was made. Tonight my father came to the house and recognized the Eames recliner that we just bought….he said, “Carter used to make one just like this, it was in the ‘Thunderbird Series. '” My father worked at the furniture plant as a kid. I did a google search to see if I could find any Carter Chairs online. Update on Carter Furniture: My dad says this is called the “scoop chair.” More info to come from Granddad. These Scoop Chairs are exactly like the ones we designed and made in the late 1950’s and early 1960’s. They are probably ones that we made. The first design of our Scoop Chair was an all upholstered one. I unfortunately do not have a picture of one in my possession, but I could readily draw it. After several years of manufacturing the all upholstered one, we designed the one pictured. Your dad, when a teenager, worked in one of the plants that made them. He was a packer, as I recall. We had several different factories making them. seating buys available at the time. My dad says that he remembers packing the boxes in college. His job was stuffing the legs of the chair into a plastic bag and then sticking assembly instructions for the user on the outside of the bag. Wow. Thank you so much for sharing your story, Carly. If your granddad (what is his full name?) has any photos or drawings from his work at Carter we would be honored to publish them here. Paul and John Carter are the “Carter Brothers” that started “Carter Brothers Furniture.” Paul is my grandfather. I will ask him about pictures or old catalogs. I have heard him tell wonderful stories about how they started their business after coming back from the war. They are both brilliant business men. I now realize that we need to document this story in writing. They sold the furniture business in the 80’s (1984, I think). For Granddad’s most recent birthday, his children (my dad and aunts) framed an old advertisement for “Carter Contemporary” furniture. I hope to post the pictures of those advertisements soon. The advertisements are 70’s/80’s style furniture…but great memorabilia nonetheless…quite funny too. try to sell on ebay. anyone’s interested. Any new info on who designed these chairs? 05.26.08 — John Carter, Jr. I am the son of John Carter who founded and ran Carter Bros. Furniture Company. I was showing him how Google operates today (May 26, 2008) and found these items. My dad immediately recognized these chairs from his old lineup. If anyone would like to contact me for more information, my phone number in North Carolina is 828-478-9797. Please feel free to call anytime. I would love to contact you, are you single John Jr? Hi all. Thanks to all of you for posting such GREAT information!!! My family are danishmod enthusiasts – and we’ve been “rescuing ” these chairs and collecting them for a while! Mom and Dad got me started on mid century modern, as that’s what I grew up with (but it wasn’t called mid century then!) . I hate to see these Carter Chairs go unappreciated, or stuck in a Salvation Army or somewhere! I have a few that are completely refurbished in premium leather! It’s worth all the work and the cost – they’re just wonderful! I would certainly love to place one or two in a good home, so, if anyone is interested, just let me know on our picture site at http://www.danishmod.com. I also own two of these chairs. I want to find out what era my couch is from as well. Here’s a photo. It has a tag under the cushions that says “Schnadig Corporation International” the material is called “luxurious nylon” I can find anything about it on the web and ive been looking so hard for the past week. somebody please help me out. I am in love with these chairs! 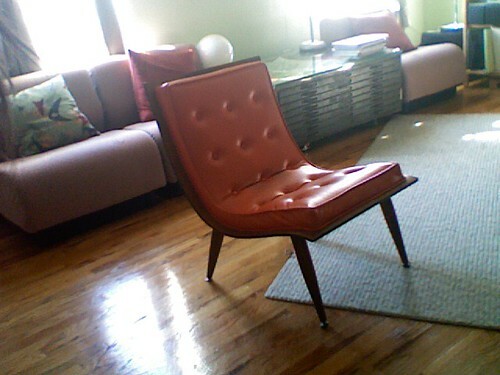 I have been in the process of redecorating my living room, and had my heart set on an Eames rocker until I saw this beauty. I just picked up a black one in Springfield for $60. The guy who sold it acted like it was just some ‘retro’ chair so we played it cool and tried not to get too hot and bothered over it. I think we snagged it in time as there was a woman in a suit hovering. Thanks to ‘monkeysox’ on sharing this site. I love knowing the story behind the piece. After what felt like hours of google & ebay searches I came across your site & breathed a sigh of relief when I read all of the amazing posts. 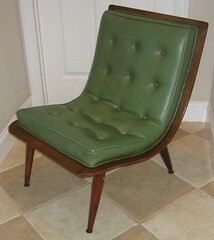 Finally… something that looks like the chair I just bought & tons of history/info to go along with it! So, now I’m wondering if what I have is in fact one of the earlier “all upholstered” Scoop chairs or if it’s something else. It has the same lines as the other chairs pictured, but the cushion on mine wraps all the way around the top and the bottom of the seat. Now that I’ve read all of the history on these gorgeous chairs, I’m even more curious to find out what it is that I have. Any help would be great! Maybe by some slim chance Carly’s Grandfather can have a look at the pics & shed some light on this mystery (assuming she still has a feed to this post). I just revisited this thread and am blown away to see that we have some facts from grand dad and other. I will be calling for even more details. Thank you. I am interested in purchasing a scoop chair for a client. Can anyone assit in this reequest. 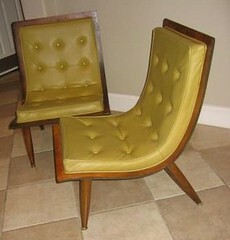 I also have been outbid on every attempt to claim these gorgeous chairs when they are listed on ebay. I would prefer not to spend thousands of dollars for these (which I do not have), but would love to purchase a matched set to go into my 50`s style room. I love the simplicity of this era, and have dedicated a room to it. 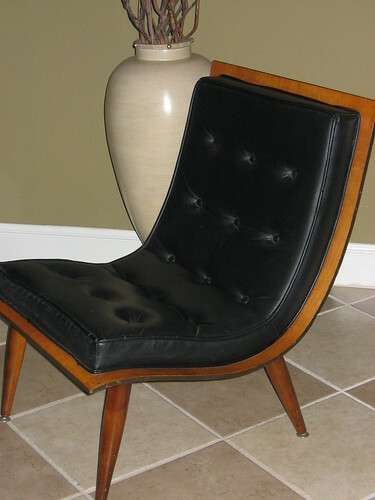 All my furnishings are modern mid century, and the icing on the cake would be these chairs. Could anyone please help me to locate and purchase a set of these wonderful (but inexpensive) chairs?? I bought this chair (the single pad version) at a resale shop for $100. As a design student, at the time, I was familiar with the bent plywood process of mid-century manufacturing. 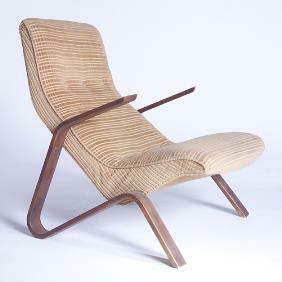 Despite not knowing the manufacturer/designer of the chair (much less it’s name! ), I admired its form, and knew it was worth something.. at least $100, cause I was willing to pay that much for it. I called it the “cool chair”. keep bringing on the info. I appreciate it ! Thank you all for posting the info on these great chairs. I love mid-century modern and most of the pieces I have have come from thrift stores. I found the yellow chair exactly like the picture above on a curb, someone had put it out for a trash pickup!!! I love it , my husband insists I should sell it on ebay, but I plan to keep it. Here’s a Scoop chair I just found on ebay – check it out! Looks like the ones above only orange color. Thanks to John Carter for posting his phone number and being generous enough to speak with us. We had a lovely conversation with him about how his dad started the company and how these great little chairs came to be. Fascinating story. He did say the upholstery was always glued to attach it to the wood – no snaps were used in his dad’s factory. Wow, I cannot believe these chairs are worth this much. I was looking around to see how much my furniture was worth as my girlfriend wants me to get rid of most of it and I’m glad I found this site! I bought my Carter chair at Goodwill of all places about six years ago for $5! Wow! Finally I have found the manufacturer… thanks! Got this from a friend of mine who I helped move a couple years ago. The vinyl was punctured by cat claws, but the wood seemed in terrific shape. However, the band Black math Experiment came to my house after their show one night and SOMEONE broke it. It has been sitting in my garage since, and I keep thinking I will toss it on trash day, but something kept telling me to try to repair and reupholster… it’s turquoise. Good to know my female furniture intuition is in good working condition. I just want to say that I got one at auction for $5 seven years ago because I thought it looked neat. I just today looked at the tag on the bottom to research it. Though I won’t give it up, I’m even more exciting about the deal I got. I snagged a pair of these gems from Salvation Army in Augusta, GA a few months ago for $15. Sadly, both the wood and the vinyl are in less than perfect condition (it looks like a dog snacked on the corners of the seats, and there are tears in the upholstery), but I am about to have them restored. I had an upholsterer examine the chairs and he discovered tiny little staples (in addition to glue) adhering the cushion to the wood. Given the comment from the person who spoke with John Jr. and said that Carter only used glue, I am now wondering if the chairs I have are in fact Carter Bros. chairs. I called John and left him a message and hope to hear back. Good luck to everyone on your quest for these scoop chairs…they are comfortable and beautiful! I just found this blog, and was struck by the similarities to the chair I own, except that mine is completely covered in a similarly-yellowed color ‘plastic fabric.’ The design concept is exactly the same, and the legs are bowed, instead of straight. It was manufactured by Bettez-Laroche of Massachusetts. I’ve been curious of its value. I obtained it from a gentleman who ran a furniture store for years in Quincy, MA. If you are interested, and think you might be able to help me with any feedback, I’d be glad to email you a picture. I have a single cushion model that i saved from my dad’s home office. I have reupholstered it in black suede and refinished the wood. I remember as a child it was in our formal living room and we weren’t supposed to play in there. But the scoop shape and the narrow 1″ wide wood border was perfect for launching my hot wheels cars off of. I restored it not knowing I liked midcentury. I jst knew it was a cool chair from my childhood. So glad I found this site. Thx. Hello! I have an orange one piece chair. That has a matching ottoman. Anybody have any ideas? Is this the same? Different company? Anybody have an ottoman as well? Thanks! I have a two cushion cream chair exactly like the one in the first picture. It has a small tear next to one of the buttons but the wood is in perfect shape. I am having a very difficult time determining pricing as it seems very rare and I can’t find any recent sales. Any help would be greatly appreciated. I just sold a pair of these last year in good condition for $600 here in Cincinnati, Ohio I also sold a single one in white for $300 a few months ago. These chairs are not rare and I’ve actually come across a few of them over the years. Here’s one on craigslist for $175 http://cincinnati.craigslist.org/fuo/3833258714.html I hope this helps. I recently acquired a black (what I believe to be) Carter Brothers Scoop chair, but the paper tag stapled to the bottom reads (piece ticket) Carter of Carolina, style-7010 5*42, cover-Vinylare, color Black, day-3. Can anyone shed some light to what I have? 1953 Carter Brothers Recliner — I see a ton of great info here (From years ago — i.e 2008), and I’m wondering if anyone still reads through this blog? I just rescued a Carter Brothers Recliner, and the description on the shipping tag says 1953, and Carter Brothers Salisbury North Carolina. 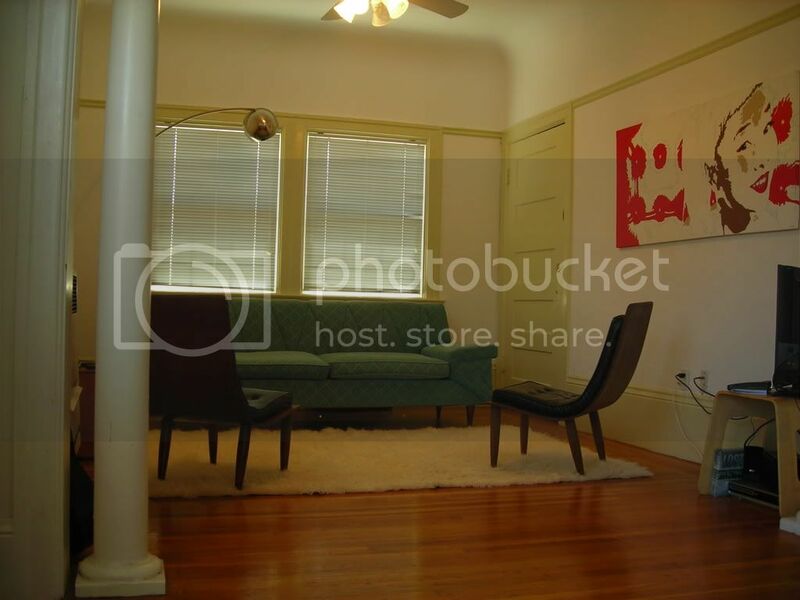 This is clearly not a Scoop or Eames chair, but something from the same 50s era, and similar in many ways. The back is curved and really tall. It has a thick black upholstered backing with a diamond pattern sewn in. The recliner still works great, and the front legs have an interesting bold carving in them. I’m trying to get more info, please let me know if anyone has heard of this. I can send photos if anyone is interested. Email me at tylerlewis408@yahoo.com. I have a bent wood scoop chair from Carter Brothers that I’m interested in selling. What is rhe going price in the market right now? Thanks! It is light oak with a brown suede tufted upholstery. Very good antique condition.